According to reports I’ve received from colleagues in Syria, this boast is not empty. Following the retaking of Homs’ Old City from the rebels in May of this year, the regime has turned over responsibility for security and administration in the Old City to the Syrian Social Nationalist Party and its militia. The SSNP, which recently celebrated its 82nd anniversary to much positive coverage from Syrian state media, has a long and tortured relationship with Damascus. Founded by the Lebanese Greek Orthodox intellectual Antoine Saada in 1932, when the postcolonial future of the region was still up for grabs, the SSNP was devoted to secularism and a particular version of pan-Syrian nationalism that saw the area now covered by the nation-states of Syria, Lebanon, Palestine, Jordan, Iraq, Kuwait, and even Cyprus, as a single historical nation, which should be united as such. Martyrdom narratives notwithstanding, the SSNP benefitted tremendously from legalization in 2005. A Greek Catholic friend from the Qalamoun region (like most young Syrian professionals, himself a member of the Ba’ath party) writes, “The SSNP is very popular, especially in Christian areas like Wadi al-Nasara. They are very organized and active. In the last ten years, they showed a lot of interest in people. In my town, they were always organizing youth activities—museum trips, pool outings.” A widely-cited (but probably unverifiable) figure puts the total membership of the SSNP in Syria at 100,000. 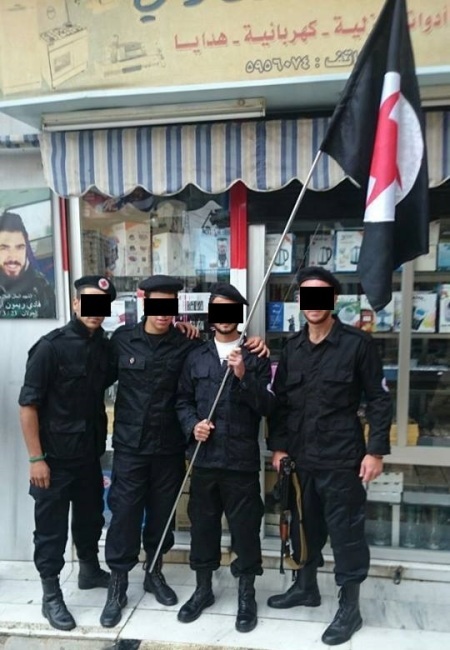 Another Syrian Greek Catholic friend, only 14 when the uprising started, regularly posts photos to Facebook of himself holding machine guns and wearing the SSNP patch. 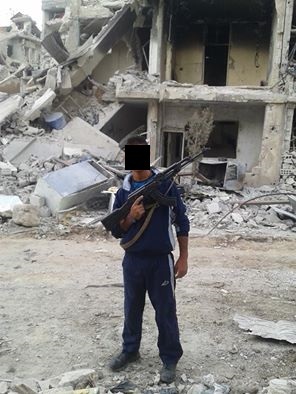 In October, he posted photos of himself in Dukhaniyah, near Qunaytrah, after fighting to retake the city for the regime. 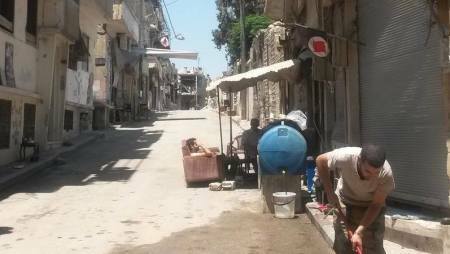 While the SSNP does not spout sectarian rhetoric, it goes without saying that Syrian Christians perceived the rebel attacks on the Christian towns of Saddad, Maaloula, Sednaya and Kassab as attacks on their faith group. One possible interpretation of the SSNP’s vigorous fight against the Syrian opposition is that of a Christian resistance against Sunni Muslim attack. But there may be an ideological precedent for the SSNP’s role in the Syrian Civil War as well. In Lebanon’s first civil war, the SSNP took up arms on the side of the Chamoun government, in defense of a nation-state it believed should not exist, because other forces were threatening to drag Lebanon into a political union with non-Syrian Egypt. 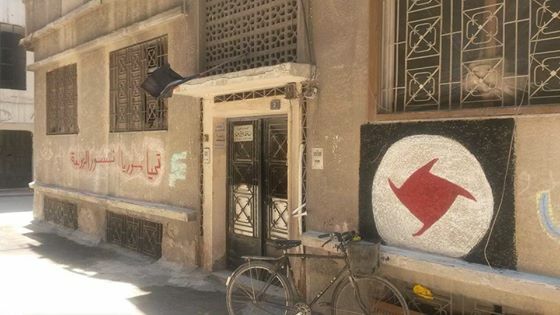 Today, in the face of a rebel movement rife with Islamists and supported by Turkey and the non-Syrian Arab states, the SSNP has again thrown in their lot with a regime they are fundamentally ideologically opposed to. From the 1950s until now, it seems, the SSNP will fight to keep any part of Greater Syria from being absorbed into a pan-Arab or pan-Islamic grouping. 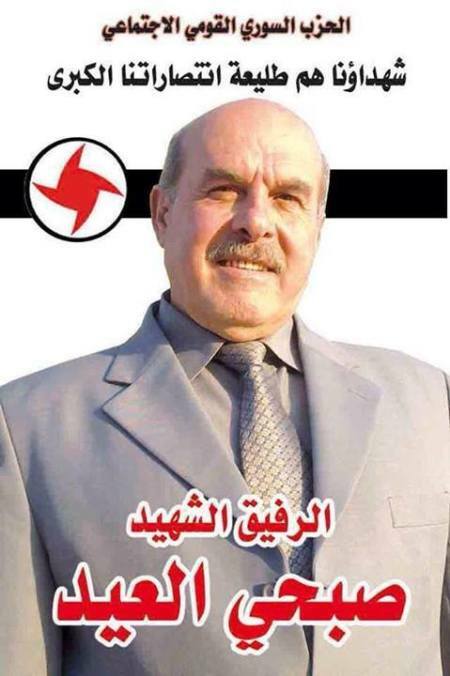 The resurgence of the SSNP deserves much more attention. A wealth of information can be gleaned from the SSNP’s social media outlets alone. 1) For decades, the SSNP’s pan-Syrian ideology was hamstrung by a division of its potential supporters between Lebanese nationalism and Arab nationalism (and later, Islamism). Could it be that the upheaval seen in the Syrian civil war is so great that it will allow for a resuscitation of the SSNP’s program as an ideology of influence in the region? 2) The Syrian regime’s delegation of responsibility to the SSNP at the battlefront and in administration of “liberated” areas like Homs’ Old City suggest that the “militiafication” of Syria, ably described by Aron Lund on Syria Comment last year, continues apace. The regime is pushing back the opposition using a fragmentary coalition of parties with disparate ideologies and interests—parties that will be in a position to make demands when and if victory ever comes. To the long list of parties in this coalition—including Hezbollah, the Popular Front for the Liberation of Iskanderoun, the Abul-Fadl al-Abbas Brigade, and the Jaysh al-Muwahhideen—we must add the SSNP. Just look at their logo and find easy connections with Nacionalist Socialist Movements (Nazis) during 1920´s 1930´s whose main disgraceful figure was Hilter. It was the fashion in the time of Pan Arabism and Arab Nationalism resurection. This is one of the causes of the cancer Syria a suffering. Also retweeted by Aboud D.
The SSNP ideology represent the dreams and hopes of Syrians and it is very natural for this party to come back stronger,when the Syrian identity is threatened by the invasion of the Gulf and their distorted Wahhabism. This party is inclusive and it has Muslim and Christian equally. This is not katayeb of Lebanon and it is not fair to project it’s image in this article as a Christian militia,look back at the history of its foundation,it is the best ideology which Syrians would aspire to. Greater Syria is the way to go to achieve stability and prosperity. 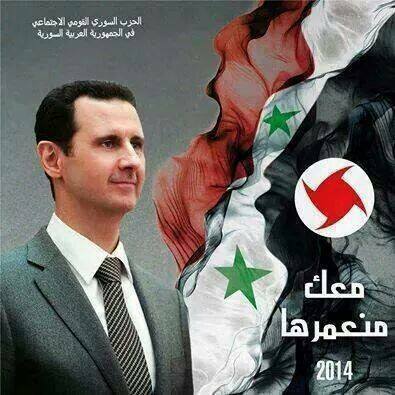 1- Full Citizenship for all Syrians which it never happened since the filthy Ottoman occupation. 2- Secular,where you don’t have to fill your children’s mind with 2000,1500-years myths in schools. 3- When people in Syria are equal and there is not any kind of discrimination (race, religion, sexism and age) then, and only then, we can built a healthy society. 4- The only way to defend a 12000-year of history and traditions against the newly-emerged countries with a filthy-petrodollar-tool to reprogram the region and keep the greater-Syrian-countries weak and poor. 5- Some of Syrians believe that a Muslim-person in Pakistan is more close to them than an-atheist-Syrian-person. As a result they will welcome Mujahdeen from Pakistan and help them to kill other Syrian people because they are not the same sect/religion. They don’t believe in Syria neither Arab, how can you build a country with that kind of ideology. I quote: “PS: Observaar… speaking of clean money, you can not compare a hard working HONEST immigrant like me who did not had a chance in Syria and came to America to study and work with a thing like you born to a family imported to Syria 150 years ago that participated into looting the country. You were born with privilege from the dirty money your family had from their bloody history. My family has no blood on its hands, not now under Assad and not before. So, an immigrant to the US who came to study and work and took advantage of the great US equal opportunity landscape. Now, this newcomer to the great US of A is still thinking like a medieval sectarian socialist product of 60 years of Baath party hate filled ideology. First, it seems that he can come to the US and become a US citizen in just under four years, others who settled in Syria 150 years ago are not Syrian and will never be. They are looters and “privileged” foreigners. Second, enjoying the secular nature of the government structure in the great US of A, one continues to think along sectarian lines: the great wonderful modern superior all embracing exclusive creed of a small off shoot of Shia esoteric mumbo jumbo. Third, even though an immigrant to the US of A, and enjoying all the privileges of such a great nation, one continues to think of belonging to another nation. If others decide to cut loose their old ties to the old country, they of course fit the preconceived straight jacket that 1400 years of hate filled rhetoric the “elders” of the off shoot faith have been spewing against the “other”. It seems that the lesson of freedom and dignity has not even scratched the surface of the skin of this medieval thinking. Of course no attachment, as an American the US is my country and like millions of Americans I embrace fully this idea nation that is born out of the very principles of the enlightenment with John Locke and David Hume Montesquieu and Rousseau and the founding fathers formulating a constitution where the Right of Man, Equality under the Law, Government From the People, By the People, and For the People shall never perish from this Earth. This is the country that allowed me to chair a division and a department and to participate fully in the workings of my professional society at the highest level without regard to my origin or creed. Here I can vote and organize and make myself heard. A more perfect union is the constant progress of a nation working together to promote freedom and dignity. I thought that the pledge of allegiance was the meaningful first step of belonging to the US and cutting loose all previous attachments, E Pluribus Unum does not seem to mean anything to some who continue to be stuck in their old hatreds. No definitely you do not qualify; neither in Syria nor in the USA. You qualify for the medieval region that is the crucible of hate and sectarianism. The ideological differences between the various groups fighting for the government aren’t that great anymore. Pro-Baath Syrians are more pan-Syrian than pan-Arab these days. I doubt anyone cares about a wider Arab state. A large Alawite/Christian/secular Sunni/Druzr state will be the solution. Let the Wahabites fight themselves in the useless desert, and give the Kurds partial autonomy, and use them against the Turks. By giving them weapons and backup. I doubt the Kurds would object to that. Bashar Al Assad, US and Iran are all behind differents teams in this chaos of all against all. Three side shared in the creation of IS. Bashar attack IS strategic centres of power. US attack parts of IS that have been created by Bashar but most attack inside Syria are theatre. Iran is not happy because US attack attack solely Iran sponsored sides. Syria has become the battlefield of an obsucre proxy war whose interests and objectives are all but clear. Thanks for posting the link. This confirms what I wrote in the previous post, which I am copying and pasting below. Apologies for the repetition for those who saw it. Communism was all about building a just non-corrupt society. Nazism was all about a utopian Germanic nation. Isis, and all other radical Islamist groups before them, are also all about building a pure just utopian nation. A bunch of terrorist criminals cannot sustain the continuous recruitment of foot soldiers. Declaring ISIS as such is grossly underestimating its potential, and its dangers. The world has done that before, twice, with Nazis and with Communists. The feelings of injustice and hopelessness are powerful fuel for radical movements. Hundreds of thousands of young Muslims are potential recruits for ISIS. They are not terrorists or criminals, they are hopeless men and women yearning for a pure utopian society where justice and hope prevail. The Muslim world will continue to produce ISIS-like groups until it starts open and frank debate that fundamentally and deeply challenge these myths. The ideology of “establishing a modern utopian society by following a law based on the Quran and Hadeeth”, will keep on producing political groups who believe that they, and non others, truly understand how to create and implement such law. Fifth Basic Principle: The Syrian homeland is that geographic environment in which the Syrian nation evolved. It has distinct natural boundaries and extends from the Taurus range in the northwest and the Zagros mountains in the northeast to the Suez canal and the Red Sea in the south and includes the Sinai peninsula and the gulf of Aqaba, and from the Syrian sea in the west, including the island of Cyprus, to the arch of the Arabian desert and the Persian gulf in the east. (This region is also known as the Syrian Fertile Crescent). The flights are sponsored by the International Fellowship of Christians and Jews along with Israel’s Ministry of Immigration and Absorption and in cooperation with The Jewish Agency, the Global Ezra movement and Nativ. With Monday’s flight, 5,134 new immigrants from Ukraine have arrived in Israel in 2014, a 174 percent increase over the previous year. Instead of desperately searching for non-existing divisions within the regime side, Syriacomment should post about the well documented ties between Israel and the Nusra Front (al Qaeda). • United States-European Union “axis of evil” the driving force behind Islamic state. • Oil-rich Persian Gulf states, Turkey funding, arming, supplying anti-Syria terrorists. Have you ever Heard about the Karma laws, the boomerang efect or that say of ¨you get what you give…? If you are looking for terrorists, then you are the one supporting the first and most extended terrorist mafia state in the Middle East, ASSAD´S SYRIA. This is terrorism is pure state, exporting terrorism to Turkey, Irak, Lebanon, Jordan and Israel for looooooooong decades. My worst forecast are confirmed. Blaming Israel for saving syrian lives is the worst idea a bloody decayed sectarian syrian can have in his tainted brain and corrupted soul. Khoroshо Sandro, Why are you trying to defend the truth with falsehood? Who is the team that you teamed up with him? Who is currently the team that represents your desires? Please write something substantial. It looks that I dismayed your weak logic so you resorted to insulting me as your habit. You called me to chat me up and this is what you come up with….. The IDF also saves the lives of Palestinians in Gaza and the West Bank. So what else is new? Meanwhile, the reporter in the YouTube video is skeptical and thinks there must be some ulterior motive. I wonder why he just didn’t ask the IDF people he was filming and travelling with. Those who genuinely believe that the US and the West have unleashed a full scale economic war against Russia because of its position on Ukraine have no idea how much mistaken they are. In fact, it was planned much earlier, precisely a year ago, when a closed meeting between senior authorities of the US and Saudi Arabia was held. This meeting was so secret that even Prince Bandar, the Saudi intelligence services chief and the head National Security Council at the time wasn’t allowed in……..
for the Merry Xmas and Happy new year and Peace to all you got thump down, so you are simply see the mentality of some of the participants here! I think they are from the religious fanatics and they have a hatred towards those who is not like them !! I hope that I am wrong in my estimation. Pathetic reply. The Israelis would not even treat innocent Gazan children like this during wartime, but al Qaeda terrorists are patched up so they can go back and kill more Arabs. Utterly disgusting, even worse those who defend it. Anyone who believes this is “humanitarian” are either lying or delusional. Paranoia is a sicknesness and many syrians became paranoics about Israel. If the identity of a national project is based on the destruction of another then once there is an identity crisis there is no foundations to resist the changes. This is Assad’s Syria, they based all their legitimacy rethorics on Israel Evil but never were able to build a nation for all syrians. Just the contrary Israel did. I always critiziced colonialist policies but one must admit facts if do not want to be mentally ill. And this is the main fact: Assad, Gadafi and Saddam failed totally in their political fight due to corruption, clientelism and lack of historical vision and respect for their own arab populations. Someone should explain the Hippocratic oath to habib. Well there are frequently stories how Israeli Jewish soldiers and police let wounded Palestinians bleed to death (sometimes for hours) by blocking the ambulances and medical personnel reaching to them. How many pregnant Palestinians and their babies have died because deliberate “delays” the on road blocks? ETC. Treating in secret the guerrilla/terrorists operating in the neighbor country is hardly sincere human help even by the rather strange Israeli moral standards. What would Israel say if Egypt, Lebanon and Jordan would give equal medical/military help to wounded numerous Palestinian soldiers who had been operating inside Israel? Healing them, giving modern weapons, intelligence, money etc when allowed to enter back to the fights inside Israel. The anti-Semitism and WW2 again howling would make us deaf. If Israel is giving real “innocent” human medical help to ALL wounded Syrians it should and could be done openly and/or letting International Red Cross to operate field hospitals for Syrians on Israeli territory (well Golan is actually Syrian territory). 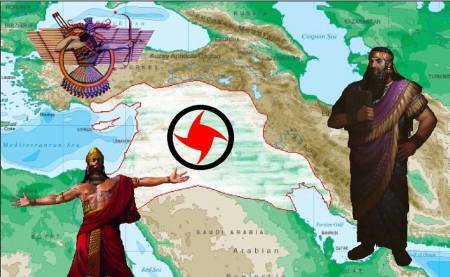 Like SYRIANALAWITE says, the SSNP are a pack of Nazis. I’m amazed that an MA Candidate at the University of Chicago, as Joel Veldkamp is, did not pick up on that. Nice way to dodge the elephant in the room: Israel supports the opposition, this is now an undeniable fact. Good short, independent and quite up to date history of the SSNP. Thank you Joel! For those who link or compare the SSNP to the Nazis, kindly do yourselves a favor and study the ideology of the SSNP and only then you can intellectually find out if this rhetoric is true or false.